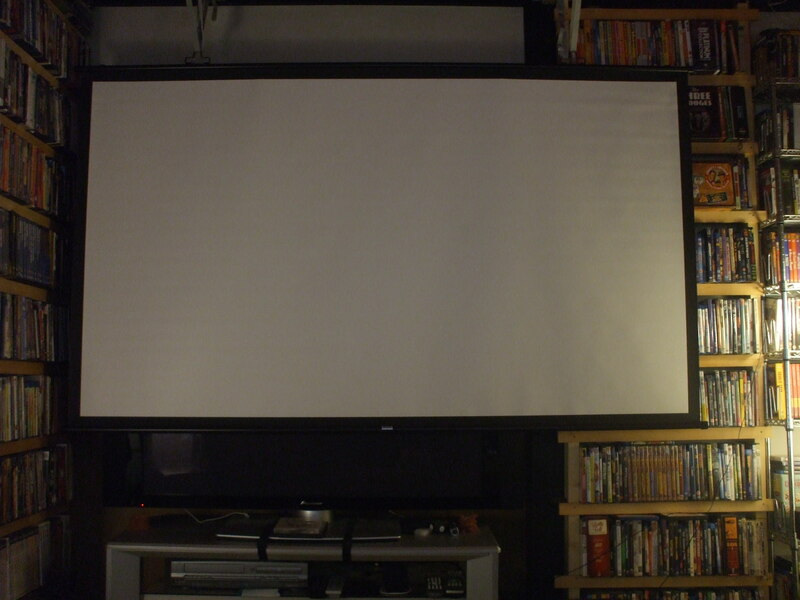 For the last two years I toyed the possibility of upgrading from a 45-inch plasma to a 90-inch projection system. I love my plasma but it’s nearly ten years old, two pixels have burned out, and big widescreen epics like Lawrence of Arabia, 2001: A Space Odyssey, and Cinerama Holiday just don’t quite cut it like they do on big movie screens. Further, while I had little interest in 3-D television when it was new – Did I really need to see Cats and Dogs 2 at all, let alone in 3-D? – my assumption that few of the classic and not-so-classic 3-D movies from the 1950s-80s would ever get released is, thankfully, proving incorrect. Not only have obvious titles like House of Wax and Dial M for Murder made it to 3-D Blu-ray, nowadays so are obscurities like Man in the Dark, The Bubble, and Dragonfly Squadron. Who’d have thought it? And so early this year I began doing research on-line and in stores, looking for the best HD projectors, screens, and 3-D Blu-ray players within my limited budget. All the best information I found on-line. Electronics stores, at least in Japan, make a pathetic non-effort to sell projector-based home theater systems. Here in Kyoto I visited every major retailer. 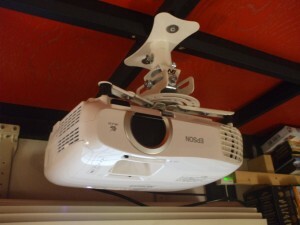 Many chain stores like Kojima and Edion (formerly Midori) don’t sell projectors at all. Others, like Bic Camera and Yodobashi Camera, are dominated by LCD models, with a new emphasis on 4K technology. While 4K sets are certainly impressive, they strike me as a transitional video format lacking the striking, sign-me-up contrast between 4:3 CRTs and their standard-def signals and the first 1080p widescreen TVs. High-def projectors were exiled far from the HDTV section of these shops to far-flung No Man’s Lands of the sales floor, near things like high dryers and toaster ovens, hidden behind curtains barely hinting at what lay behind them. At one store five or six projectors were set up under less than ideal circumstances and all were showing Monsters University (in-2D), hardly representative of what these babies can do. Worse, at another outlet, projection beams bounced off mirrors onto screens barely larger than most laptops. What’s the point of that? But technophilic websites provided detailed reviews of almost every piece of hardware I had under consideration and, without ever really having the opportunity to actually see even a single HD projector optimally displayed I decided to take a chance. I had a gut feeling I’d be happy with what I purchased, and anyway I was still keeping my 45-inch plasma, figuring I could continue to watch the news and older TV shows (like Kinescoped episodes of The Honeymooners) on that. I ended up buying an Epson Dreamio EH-TW5200 projector (cheaper in Japan right now than in America), a Sony BDP-S5100 3D Blu-ray player (none of my existing players were 3-D), three pairs of Bluetooth 3-D glasses, a Sanwa 16:9 90-inch screen (model number PRS-KBHD90), and a generic, universal ceiling mount (NB T717M). The generic mount came with terrible installation instructions but I saved a small fortune buying this no-name one (about $25) vs. an Epson model (about $300). I saved a lot of money installing everything myself, and purchasing the screen, ceiling mount, and glasses via less costly brands. To get everything mounted and up and running, I also invested in an extra-long HDMI cable (10 meters), and additional material from the local hardware store to mount the screen to the wall. Looking back, I’m glad everything arrived piecemeal over several days, allowing me the time to carefully install and check each component properly. Once, all set up, I was dazzled. Absolutely dazzled. During that first week I gave the system a workout with movies filmed over different eras, countries, and in a variety of formats: Bolt (3-D), The Hidden Fortress (in Toho Scope), Dial M for Murder (3-D), The Blues Brothers (1.85:1), Tron Legacy (3-D), Creature from the Black Lagoon (3-D), The Seven Year Itch (CinemaScope), Perfect Friday (1.66:1), The Great White Silence (a silent film in 1.33:1 format), Destroy All Monsters, The Flesh and Blood Show (part-3-D), Grand Prix (Super Panavision 70), Man in the Dark (3-D), Fantasia 2000, Toy Story (3-D), The 300 Spartans, and Chain of Evidence (a 1.85:1 Sony Choice Collection DVD-R), Wild Oceans (IMAX 3-D), Phantom of the Paradise, and Samson and Delilah (1.37:1 Technicolor). The Price. Sharp’s 90-inch 1080p 3-D television retails for $10,999.99 (though as I write this it’s on sale for a “mere” $7,997.99). 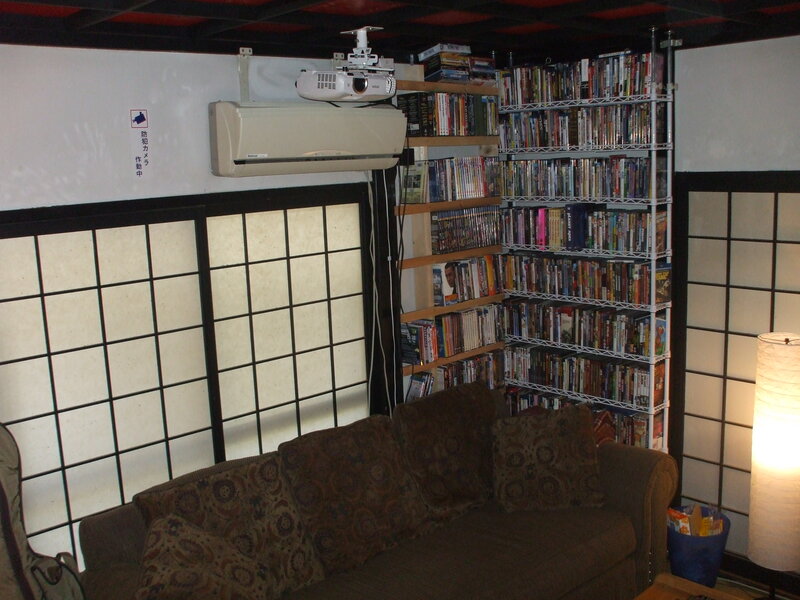 Conversely, for absolutely everything described above – the projector, screen, ceiling mount, 3-D Blu-ray player, three pairs of 3-D glasses, and various lumber, screws, wall brackets, etc. (to wall-mount the projector myself) I spent around $1,250. My 45-inch plasma cost more than three times that ten years ago. It was also close to what I paid for a 28-inch 16:9 tube set some years before that. As my hard-to-impress wife said upon seeing it projected for the first time, “Gee, I guess you’ll never need to go to a movie theater ever again.” For $1,250, that’s quite a bargain. The Picture. My budget didn’t allow a 4K projection system but, truth be told, I don’t need one. My Epson delivers the goods, with an extremely sharp, bright, and color-filled image that, frankly, looks a heck of a lot better than I see in most movie houses. The two big concerns I had were brightness and blacks. The former isn’t a problem because Japanese houses have big metal shutters on all the windows (useful when there’s a typhoon) and even in broad daylight I’m able to make the room completely dark. This will also help me extend the life of the expensive-to-replace projection bulb, as I’m able to set it at “Cinema” (i.e., economy mode). But even if I wanted to let a little light into the room, projection systems these days seem to be plenty bright. Blacks are a little less inky than on my plasma, but this is more than compensated with advantages noted in Points #5 and 6. The Sound. My 5.1 sound system enhanced movie-watching on my plasma, but the much bigger screen also meant moving my left and right speakers farther apart, and I’m also sitting much farther back from the screen than I did with my plasma. All this has led to much more obvious directionality in terms of the sound effects and, in the case of early CinemaScope and big road show titles, more directionality with the dialogue, too. The 3-D. I’ve seen 3-D projected 80 different ways, from optimal viewings like the House of Wax screening I once attended on the Paramount lot with director Andre de Toth in attendance, to wretched showings of Gorilla at Large on commercial television in the early ‘80s. Once again, the Epson really delivers, with a perfectly bright, near-perfect presentation on everything I looked at, with Creature from the Black Lagoon, Wild Ocean (which had my six-year-old reaching out to “touch” the dolphins swimming toward the camera), Man in the Dark, and Bolt looking particularly glorious. No complaints here. The Big Screen. First, yes, obviously, BIG movies like Cleopatra, Star Wars, Patton, The Big Country, and South Pacific look much better. But there’s also something subtler going on here. Technically, I’m probably not actually seeing that much more detail on the 90-inch screen that I couldn’t also perceive on the 45-inch plasma, but the much larger screen (area-wise, more than three times larger) psychologically makes images much more immediate, intimate, and lifelike. I’d liken it to the difference between having big coffee table arts books and actually seeing big canvasses up on real walls in real museums. I started watching the British heist film Perfect Friday (a region “B” Blu-ray) on the plasma, before the system had arrived, and the second-half on the projection system, and it was a completely different experience. I found myself much more engaged with what I was watching. I was less tempted to check my cellphone, to see what was new on Facebook. For the first time in a long while, I regularly watched whole movies fully engaged and all the way through without a break. The Advantages of a Projected vs. Plasma/LED Image. No more over-scanning. 1.85:1 is 1.85:1, not 1.78:1. More subtly, watching a projected image reflected off a screen offers a distinct aesthetic advantage over plasma or LCD television light directly entering the eye. This is something hard to explain, except to say that whites aren’t as harsh, and colors seem both more natural and richer at once. The Surprising Fact About DVDs. While awaiting delivery of my new system’s various components I anticipated limiting the projector to Blu-ray discs while continuing to watch regular standard-def DVDs on my plasma. Standard-def DVDs were going to look pretty terrible on a 90-inch screen, right? But then, because during those first few days I was still trying to figure out how best to retract the screen I decided to give Chain of Evidence and an old Monogram Western starring Johnny Mack Brown a try. These were Warner Archive DVD-Rs (one 1.85:1 enhanced widescreen, the other 1.37:1 standard size) drawn from less-than-pristine film elements. Yet even these looked surprisingly good, with the built-in upscaling on the projector they were perfectly watchable. Blu-ray, naturally, looks better, but my DVD collection has hardly become obsolete. I toyed with getting a 100-inch screen instead of a 90-inch one but I made the right choice. The room is relatively small and, zoomed as wide as it will go and mounted near the opposite wall, the Epson projects a nearly perfect 90-inch image. Those retail stores I visited were, in my view, simply nuts not to push HD projectors more than they do. If consumers saw what these machines are truly capable of I’m certain they’d fly off the shelves. I couldn’t be happier with mine, and I urge all hard-core cinephiles to consider a projection system the next time they are ready to upgrade. 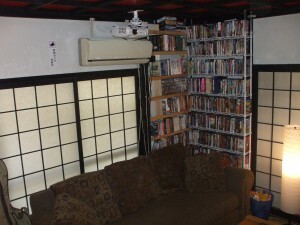 The room isn’t all that big, something like 10 x 13 feet, thereabouts. The throw of the projector is certainly less than 10 feet, with the projector zoomed all the way out to fill the 90-inch screen. Get off that fence!